Divinity is the first new Valiant series in a while that doesn't seem to have any direct connection to the rest of the "Valiant-verse." I think that is a huge strength for this book. Don't get me wrong, I love the Valiant universe, but this book felt very unique and distinctive, standing out even among the rest of the terrific comics that Valiant puts out every month. 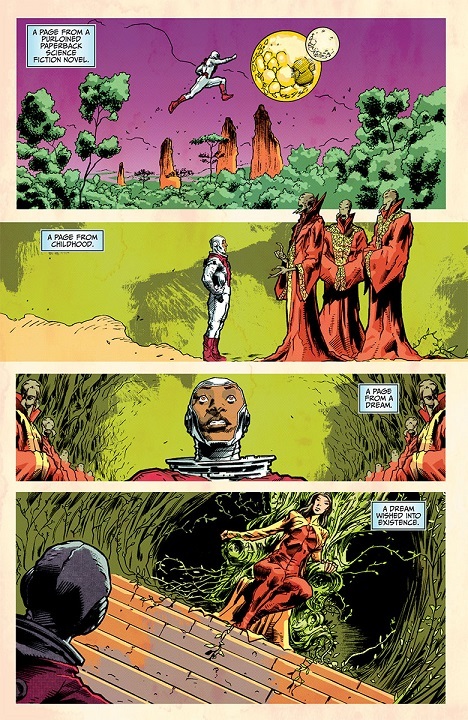 Summary (contains spoilers): Divinity starts with a baby named Abram Adams being abandoned on the doorstep of the Russian Foreign Minister in the Winter of 1945. There is a mysterious stranger watching this scene wearing what seems to be high-tech armor. Abram's adoptive parents soon die, and he become a ward of the state. Abram seems to have genius level intellect and phenomenal physical attributes. The state is grooming him to be a symbol of Soviet Superiority. Abram is selected for a top secret Soviet space mission. A rocket aimed at "the edge of the galaxy." It is intended to be a thirty year mission. Abram has no family ties, which makes him perfect for this mission. He accepts. Through medical science, the Soviets increase his immune system, and slow his metabolism and aging. The story jumps to modern day. In Australia, a man named David Camp is climbing a mountain. He starts to slip, and the mysterious armored figure from the first page shows up. He definitely looks like Abram all grown up. David freaks out, and ends up falling off the mountain, taking a nasty hit to the head. Confused and concussed, he ends up wandering into the desert. Dehydrated and poisoned by a snake bite, he ends up wandering into what seems to be the Garden of Eden. He collapses. We flashback to continue Abram's story. Before he left, he had a tearful farewell with his girlfriend. He reaches space, and ends up encountering alien beings. Back in modern day, David wakes up to find Abram welcoming him. Some distance away, some men who appear to be military are watching all this through a sniper rifle. They are called Operation Divinity and supposed to be observing what's going on here. Abram notices them watching, and seems to turn one of them into a bird and causes the others to hallucinate. It seems to be talking about another baby being abandoned, this one in modern day. Review: I loved how this story was told. It almost felt like a modern tale fairy tale. The narration tells Abram's story so beautifully. There isn't a lot of dialouge throughout this issue, but the narration works perfectly. I wouldn't hesisitate to say that I felt as hooked as I did in the early chapters of the Hobbit or the first Harry Potter book. It's just that well written. Abram feels like a well developed character. You get a true sense of where he comes from, and how the world sees him. It's only quick, but I really liked how they introduced the difference between Russians views on blacks in the 60's were compared to America. Kindt introduces David Camp and Operation Divinity quickly, but enough to make you want more. There are a lot of pieces here, and an intriguing mystery on how it all fits together. This issue tries to do a lot, and I think it succeeds admirably. You basically get 70 years of alternate history boiled down into 22 pages, plus a lot of characters and concepts introduced. There is a tremendous amount of discovery and wonder here. When they introduce "aliens" towards the end of the story, you don't even blink an eye. It all just makes sense in the context of the fairy tale you are reading. The art on this book was just great, especially when we see Abram in full costume. Again, this book's sense of wonder was key to why I enjoyed it so much, and the art supported that perfectly. I did have one complaint about this issue: the last page or two. The mystery throughout the book is so compelling, but some aspects of the last page or two just seemed weird for the sake of being weird. Were the men of Operation Divinity hallucinating, or were they really being turned into birds and butterflies? Also, why were these people talking about abandoning a child. They probably aren't Abram's birth parents, since both of them are white and this was 70 years later. I was so enthralled by the rest of this comic, but the ending sort of threw me some. It also made me realize how carefully constructed the rest of the issue was. It was on such a tight razor's edge, that when things felt off, it made the whole rest of the book seem off too. That said, it really didn't change my feelings about this book. 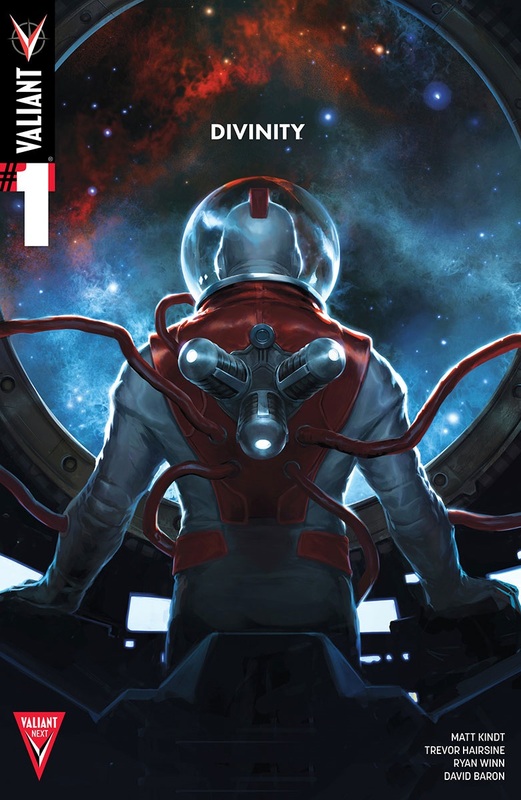 Divinity is a great new comic from Valiant, and seems to start an exciting new chapter of Valiant. I have wanted to see what Valiant can do outside the confines of the Valiant universe, and if Divinity is a sign of things to come, then Valiant should be in great shape! There was nothing that really made this issue stand out to me. It was just kind of there. Is it worth your $3.99? Definitely! I didn't quite love the way this issue ended, but the rest of the comic more than made up for that. And I suspect that when we get a better understanding of what we're seeing in the end, it will make me feel much better about how this issue ended.